JUDGE IARFHLAITH O’NEILL’S garda whistleblower report will not be published in full today. Only the terms of reference, conclusion and recommendations from the report will be published. 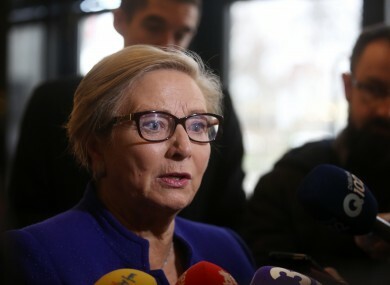 The former High Court judge was tasked with reviewing the disclosures made by members of An Garda Síochána to the Minister for Justice and Equality Frances Fitzgerald in early October. The report, which was delivered to the minister last year, deals with claims that senior gardaí mounted a smear campaign against a prominent whistleblower in the force. Garda Commissioner Nóirín O’Sullivan has denied involvement in any such black propaganda. On foot of the report, Taoiseach Enda Kenny announced yesterday that Supreme Court judge Peter Charlton will chair a Commission of Inquiry. Upon legal advice from the Attorney General’s office, it’s understood the full O’Neill report cannot be published due to the allegations being made under the Protected Disclosure Act 2014. Government sources state it is not possible to put the entire report in the public domain at this time in view of the nature of the allegations. While there has been disagreement over the validity of the Attorney General’s advice in the past (in relation to abortion), there is complete agreement with the current direction by all government members, including those in the Independent Alliance. Following yesterday’s announcement, there have been calls for the Commissioner to stand aside. Independent4Change TD Clare Daly, who has raised the issues of the whistleblowers’ cases under Dáil privilege on numerous occasions, said O’Sullivan should be removed from her position while the inquiry is being carried out. Fianna Fáil’s Jim O’Callaghan welcomed the establishment of a formal inquiry, but did not call for O’Sullivan to stand aside. It’s understood there were no discussions in Cabinet yesterday about the Commissioner stepping aside while the inquiry was held. Read: Explainer: What exactly does Ireland do to protect whistleblowers? Email “Garda whistleblower report will not be published in full”. Feedback on “Garda whistleblower report will not be published in full”.